The Richard Flint photography blog was started in February 2007 as a website for new images, website and podcast links, reviews and articles, covering a broad range of photographers and photography. The blog contains news, reviews, website and podcast links, photographer profiles, etc. While the photography blog may cover on a wide variety of photographic topics, its main focus is on the processes of image making. From Wet Plate Collodion right through to the most recent digital multimedia, the blog focus is on the image itself and not the equipment used to get it. Subscribing to the Richard Flint Photography blog is easy using RSS! You can also sign up to the photography blog’s E-mail updates that are delivered directly to your E-mail inbox. Just enter your email address into the sign-up forms located in the blog’s sidebar. Unsubscribing from the E-mail update service can be done at any time. A second photo blog called Darker Skies was launched in August 2009 and is a more personal, informal blog. It’s a photography scrapbook, a mobile blog, a home for the podcast links page and a place for occasional observations on photography. This page displays four of the most recent posts from both of the blogs mentioned above. Launched in February 2007, the Richard Flint Photography blog has a large archive of posts covering classic and contemporary photography, influential photographer profiles, links, reviews and more. My Billingham 550 - a veteran of many adventures and nicely worn in after 22 years of use. 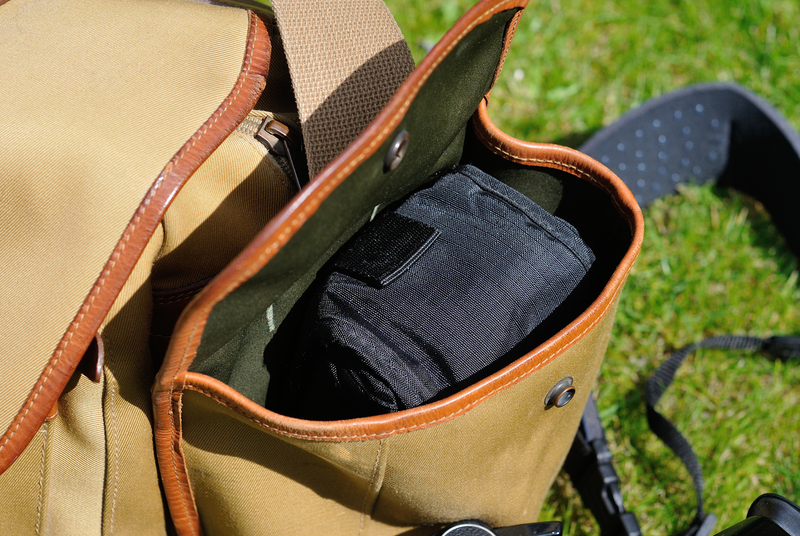 Ten years ago, i posted a review for my Billingham 445 camera bag on this very blog. The review started "Billingham bags are a popular choice for many photographers looking for a robust way of carrying their expensive equipment around." I could never have imagined that the review would become the blog's most popular post, one of the most commented posts on the blog and is mentioned in the references on the Billingham Wikipedia entry. A popular choice indeed! 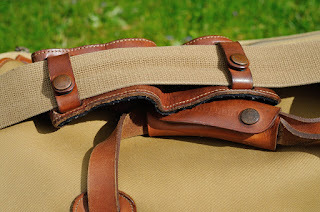 For many years, I've wanted to post a review of my trusty 550, the first Billingham bag i purchased 22 years ago, but for one reason or another i never got around to writing the review. To mark the tenth anniversary of my popular 445 review i thought i would finally write that 550 review... so here it is! The story of my Billingham 550 starts in 1996 when i decided that i needed a new camera bag. I'd purchased a Jessop's camera bag back in 1991 which had served me well, but i decided that i really needed to upgrade to a better quality of camera bag. At the time, i was a photography student and one or two of my fellow students had Billingham camera bags (mostly 335s) that i could have a close look at. I purchased mine at Jessops (the other customers in the store at the time exchanged impressive tales of how Billingham bags had saved camera kit) after weeks of looking at one in the shop window. The build quality was very impressive and i also liked the classic design - I still do all these years later. I finally decided to go with the 550 due to its size - it is a spacious bag - it could carry everything i needed. In an ironic twist the purchase of my 445 some years later would stem from the sheer size of the 550. More about that later. So to the bag. As i said earlier the 550 is a huge bag that Billingham describe on their website as "our most luxurious bag - perfect for the photographer or the traveller. Even without the two detachable end pockets, it is still large enough to carry several camera bodies, lenses, flashguns and even some overnight stay essentials". The 550 was the first production bag for Billingham and has influenced the style of the bags that have followed. 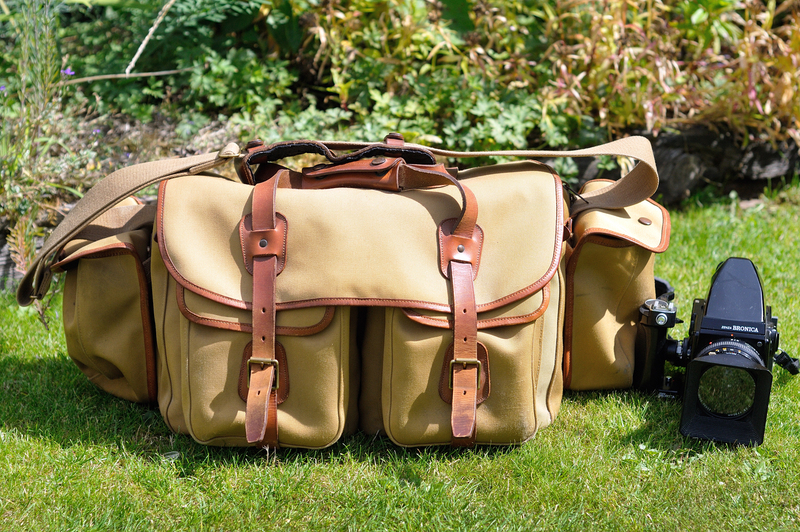 My bag is the classic khaki canvas with full grain tan leather and brass fixings, now all nicely worn in after many years of use and usually associated with the classic Billingham look, however two other colours are available including black and a rather bold Imperial Blue Canvas. The light colour of the bag does mean that the dirt can show but the 550 is very easy to clean - mud can easily be removed by just waiting for it to dry and then brushing it off. Soap and warm water usually removes dirt from the bag and you just leave the bag in the sun to dry. Simple. The internals of the 550 are very spacious and can accommodate a wide variety of camera systems and lenses. The dimensions can be found on the Billingham 550 product page here. If you like carrying a mix of camera systems then the 550 has plenty of room to carry a medium format camera and a DSLR plus lenses. I regularly carry 6x6 and a DSLR in the same bag. The bag's depth is a serious asset with room for a high hammerhead flash gun like the Metz 75. The depth is also handy for keeping kit away from prying eyes and out of the weather . It also helps with what i call 'working out of the bag' - everything can stay within the bag when working at a location so you don't leave anything behind. With the internal partitions, the layout possibilities are numerous, though it can take a bit of trial and error to find that perfect layout to fit in all your kit. Billingham have a range of additional superflex dividers available to purchase but I've largely managed with the partitions that came with the bag. Whatever you need to store - the bag will fit it in. Right at the bottom of the 550 is the bag's 500 Superflex base plate that protects gear from vibration, knocks and the damp. It can also be removed if necessary to turn the 550 into a great travel bag, ideal for weekend trips away. Externally the bag has five pockets, two deep zipped pockets that can fit large items like a flashgun, and two smaller outside pockets with stud fasteners that are perfect for carrying filters, memory cards or other items. Once the top rain cover is fastened up using the brass buckles and leather straps, the pockets are pretty secure. More space is provided by the zipped external back pocket that can be used to store maps, receipts or documents. 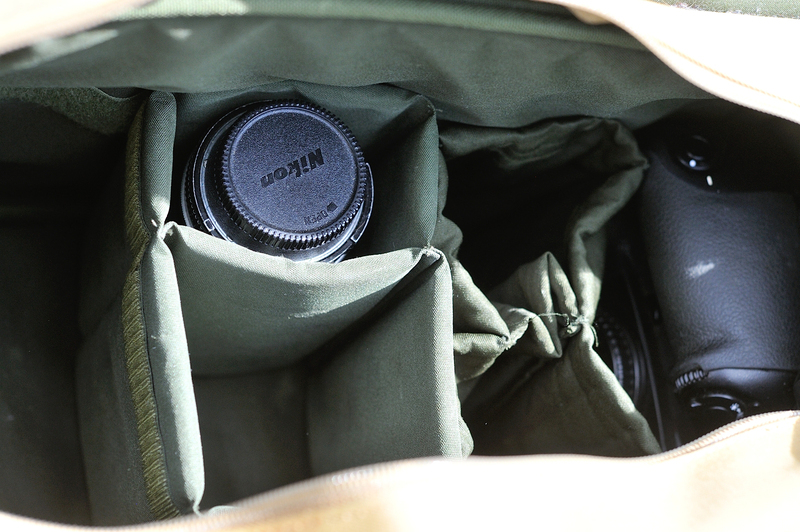 The 550 also comes with two detachable end pockets which i found useful for storing film and filter hoods. The detachable pockets have limited padding, just like the studded side pockets, so aren't really designed for storing lenses or any delicate objects. The pockets are, however, great as working pockets for placing film, memory cards etc during shoots or for keeping the rain away from items during a sudden downpour. Carrying the bag can be done using the leather hand strap or using the shoulder strap. The SP20 shoulder pad is wide and comfortable with a very grippy rubberised neoprene, making the task of carrying a well packed and balanced bag, a pleasant one. The external canvas skin of the 550 looks very classy, is incredibly waterproof and is about as durable as you can get. I've been in downpours with my 550 ( one rain soaked day at Sandringham in Norfolk was especially memorable) and often wished that i could get into the bag as well! Gear remains dry and well protected from water, sand, dust and mud. I mentioned in my 445 review that ' These bags are designed to take all sorts of punishment - the most common of which will be water. The water proof nature of the 445 is remarkable. I've been in storms and downpours which have thoroughly tested the bag, with no problems encountered at all'. That statement equally applies to the 550. A few years ago, during a visit to Norfolk, I accidentally dropped my 445 ( i was with it too i might add!) into thick harbour mud. The camera gear remained totally safe inside. The mud just washed off the canvas bag with the aid of a sponge and a bit of soap. Temperature control inside the bag is excellent too. 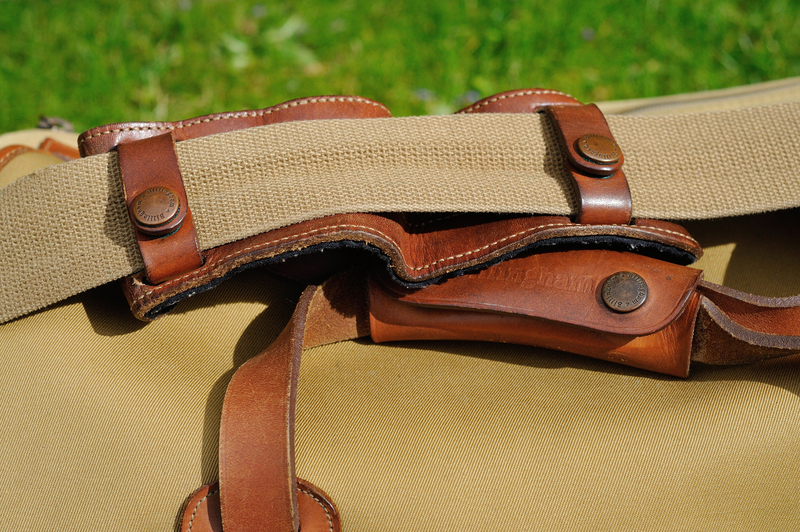 During hot sunshine the inside of the Billingham 550 remains noticeably cooler thanks to the khaki coloured canvas (darker coloured 550s might not fare as well!) and the thick partition inserts. If the bag is kept closed then the contents will remain cool. So what about the downsides? Well the bag's physical size can be a bit of a double edged sword. The 550 is of a size that can be quite difficult to carry in confined spaces such as a busy train carriage - especially if the end pockets are attached!. I decided to switch over to the slightly smaller 445, a few years later, partially due to that size issue. Another problem can be the weight. Fully packed the bag can be quite heavy so carrying it over rough ground or long distances is far from ideal for your back!. I found that out when visiting the Highlands of Scotland in 2012 where the backpack type camera bag is the better option. 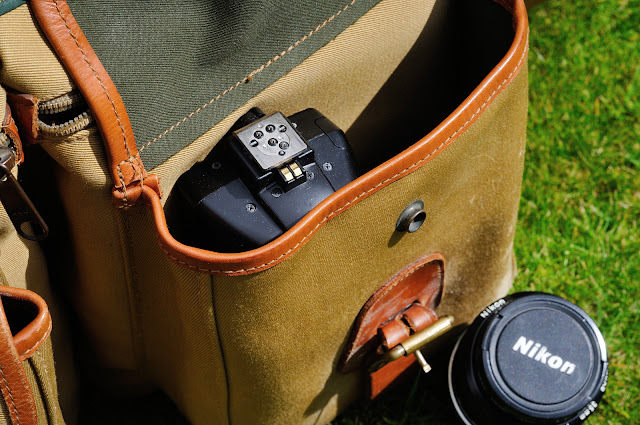 An interesting suggestion from the Billingham website states 'Many 550 owners use them as a safe store for all their equipment and use one of our smaller bags to carry just the specific gear they need to take the shot, going back to the 550 to swap lenses or bodies. One final thing to mention regards the difficulty in carrying the bag by hand when the rain flap is open. The only way is to use the shoulder strap, as the buckles need to be fastened to use the leather handle on top of the bag. That said, closing up the bag each time provides extra security and develops into a good habit. The 550 has plenty or storage with a variety of pockets to store away accessories. In conclusion, the Billingham 550 is a great camera bag. Solid, reliable and comfortable to carry. It is not cheap but then quality never is. Billingham list it on their website for £600 but it can be found for well under £500. The secondhand option is also worth considering with a 550 in good condition going for around £200+. One thing to consider when buying the 550 is it will last a lifetime if looked after. Potentially it could be the only bag you may ever need to buy. I've had over twenty years of use, through college, university and freelance life... and mine is just nicely getting worn in. I expect I'll be using it in another twenty years or more. 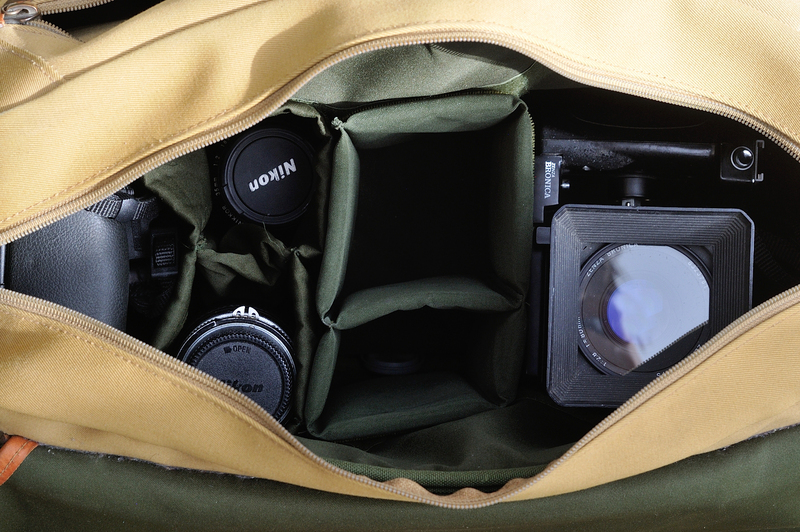 The bag provides a fantastic amount of storage for a range of camera systems including video and 5x4. The solid robust construction does come at a price, adding extra weight to the bag, but you get peace of mind that the 550 will take whatever you, or the elements, throw at it over many years and comfortably protect all your gear inside. Exactly what a good camera bag should do! Like many photographers i have quite a few camera bags, many of which have been bought for a specific task or purpose. 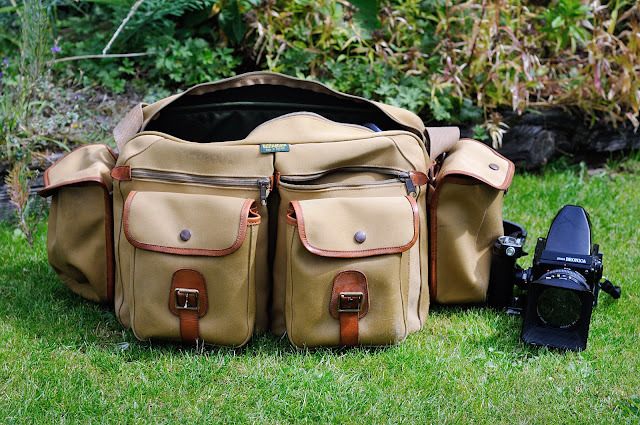 I would, however, never get rid of my 445 and 550 as they are the best camera bags i own. If you are looking for a big camera bag then you'd be hard pressed to find a bag with the storage space, superb build quality and protection offered by the 550. I certainly love mine. It certainly doesn't seem like four years since i wrote a couple of posts about the film Performance, a film that still intrigues me... and others it seems. Since then, the posts have become some of the most commented and read on the blog. 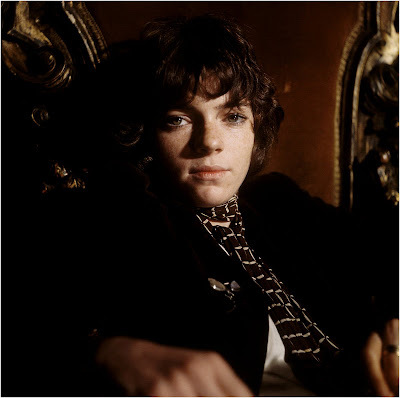 While i was moving through the internet recently i came across some interesting articles and a video about the photographs taken by Cecil Beaton for the film's publicity. Beaton ended up being paid by Sandy Lieberson, Performance's producer, because Warner Brothers would not pay the bill. The images were part of an exhibition by Sotheby's in 2016. Sadly the online images only appear to show the 'names' in Performance which is a shame. The excellent portrait above of Michèle Breton certainly looks as though it was taken by Cecil Beaton though at the moment i can't confirm it. It's been a long time since i last saw this BBC2 programme on Tim Page. I'd be around 13 year of age, off school ill with some bug or another, and that summer i'd just got my first camera - a 126 Hamimex 88x - from a chemist shop on the high street in Conwy, North Wales. The journey had begun. The shop is still there. I still have my first camera too. Certain scenes from Mentioned in Dispatches were burned into my head. Page going through his slides and explaining the story behind them is one scene that made me realise that photography was not just about landscapes and holidays, it could inform and educate and i loved the power the images had. The fact that Page was still visibly affected by his head injuries received in 1969 was also something i remembered vividly. There was a cost to taking the images. The photography of the Vietnam war still fascinates me now. Tim's star has waned over the years as he dropped down my table of favourite photographers. He was good... others were better. I've come to prefer the work of other photographers who captured the war without the rock n' roll attitude of Page. The photojournalist, played by Dennis Hopper, in Apocalypse Now was alleged to have been based on Tim Page. I much prefer the quiet professional attitude of Larry Burrows. It is good to see this film again though. Amazing what the mix of a Vietnam war photographer documentary and a chemist shop in North Wales can do. If you are looking to brush up on your early photography history then a podcast available on the BBC website might just be of interest. Back in July, the BBC Radio 4 show 'In Our Time' recorded a 45 minute programme where the topic of the invention of photography was discussed by an expert panel. The lives and work of Louis Daguerre and William Henry Fox Talbot are talked about in some depth along with the effect that early photography had on society. 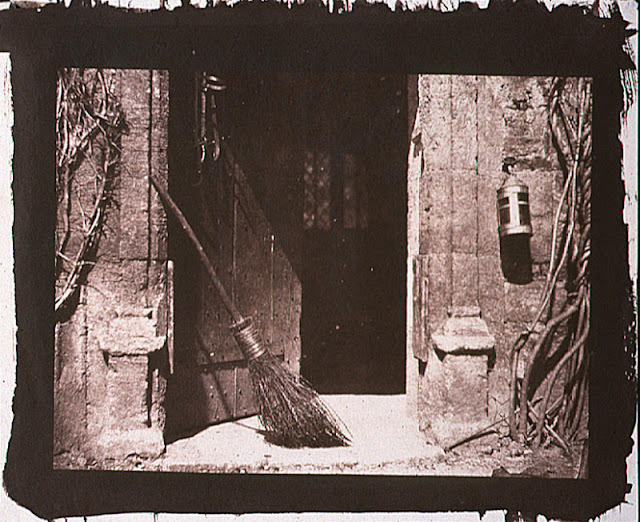 The various early photography processes, many of which used toxic ingredients that caused ill health for the pioneer photographers, are also discussed in some detail. It wasn't surprising to find out that early photography was a pursuit of wealthy gentlemen. Photography in the 19th century was an extremely expensive and time consuming business. Even having your photograph taken by the early 'pro photographers' was an expensive luxury few could afford - 300 guineas was charged for a portrait (One Guinea is £ 1.05p) taking it well beyond the reach of the average person. The podcast is available to stream via the BBC site and there is also a MP3 download which means that anyone outside of the UK should be able to access the programme. A photography scrapbook, mobile photo blog... with occasional musings on photography. There are two photography blogs currently online. The Darker Skies blog, started in August 2009, is a more personal, informal blog. It’s a photography scrapbook, a mobile blog for when I’m out and about, home to the podcast links page and a place for occasional musings and personal photography.